Spend less time on time off. Say goodbye to time-off requests scattered across emails and sticky notes. 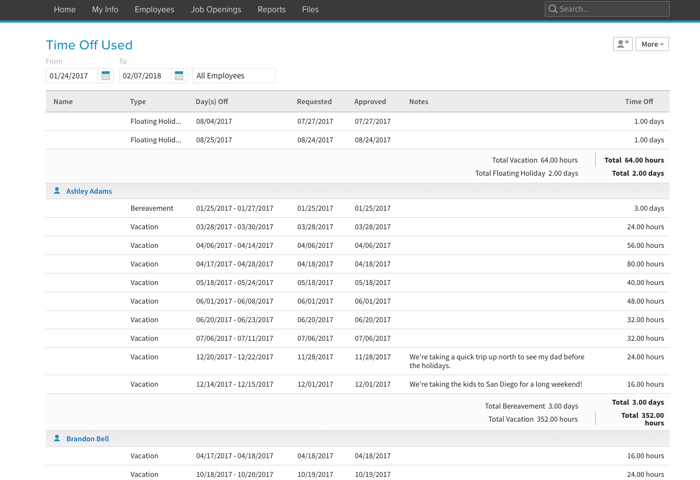 BambooHR keeps track of PTO balances for your whole organization and directs requests to the right people for digital approval, with easy reporting and a dashboard visual showing who’s out of the office. 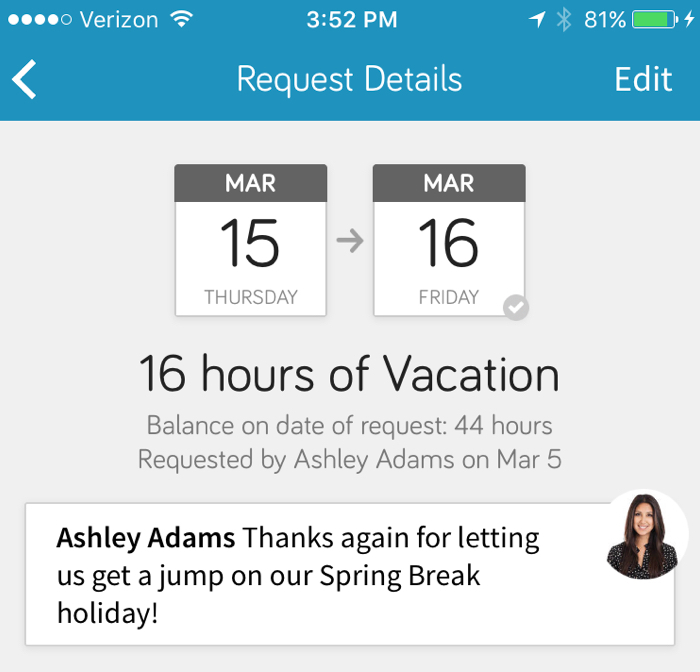 You'll love being able to create custom time-off policies that accrue automatically, and employees and managers will love using the mobile app to submit and approve PTO requests. Take a permanent vacation from complicated vacation tracking. 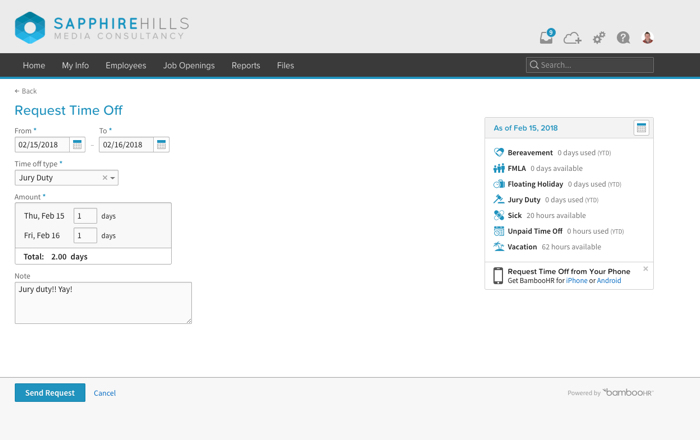 Try easy time-off tracking with a free seven-day trial of BambooHR. When you’re trying to keep track of employee PTO on a manual spreadsheet, it’s easy for records to slip through the cracks. The average employee takes an extra three days of unreported PTO each year because of faulty vacation tracking, costing their company thousands of dollars per year. Our automated PTO tracking system manages everything for you—no more updating a calendar for hours or second-guessing PTO accruals. With accurate data that’s always up-to-date, you’ll save yourself (and your organization) significant time and money. Powerful doesn’t have to mean complicated. BambooHR’s employee vacation tracking software is simple and intuitive, so you’ll be able to get it set up and going quickly—no computer science or math degree required. Of course, new software is only effective if the rest of your organization adopts it, too. We’ve designed everything with ease-of-use in mind, so employees and managers can learn the system and start using it right away. Go mobile with PTO tracking. “How much time off do I have left?” If you had a dollar for every time you’ve heard that question...well, you’d be on your own vacation right now. But with BambooHR’s mobile app, employees can check their PTO balance anytime. In fact, everyone in your organization can check their PTO, calculate future vacation time, and submit time-off requests right from their phone. 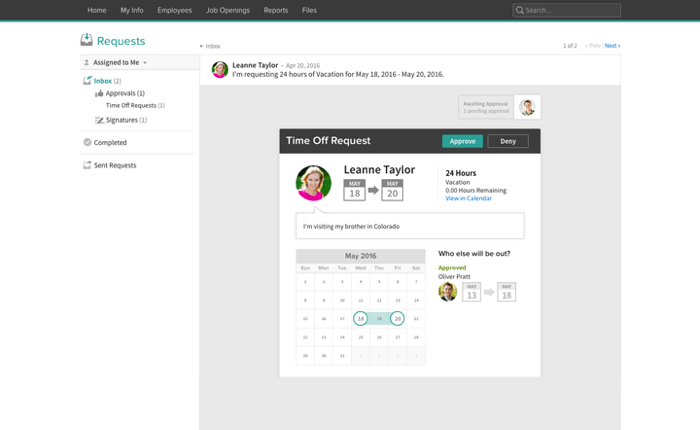 Supervisors can also approve requests on the app, making leave management easier than ever before. If you’re tracking PTO in spreadsheets, putting together an accurate time-off report may sound like a fantasy. But with BambooHR, you can generate several different reports with just a few clicks. We give you the data you need to dive deeper into employee PTO. You can identify employees who are at risk of burnout by tracking time-off balances, decrease unplanned absences by monitoring the time-off-used trends, and more. BambooHR helps your employees live happier and healthier lives and boosts your organization’s performance at the same time. No more mystery absences or surprise vacations. Unplanned absences can throw a huge wrench in your organization's workflow. Even an approved employee vacation can mess up plans and deadlines if no one knows who’s in and out of the office each day. But updating a company-wide calendar each time a request comes in doesn’t sound like the most effective leave management either. That’s where our Who’s Out Calendar comes in. 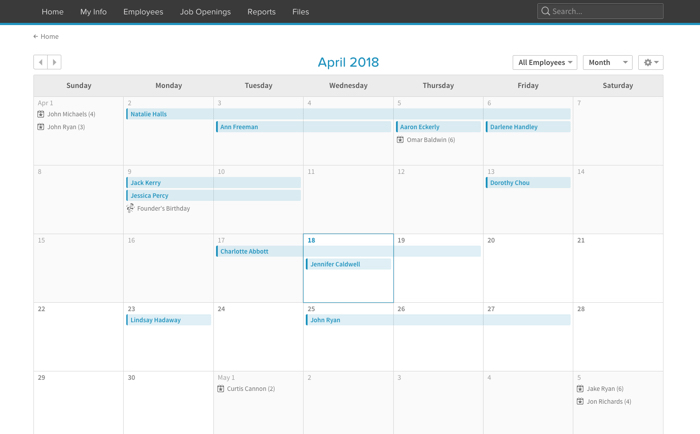 You can see at a glance who has scheduled time off today or in the next few days, so when you’re planning that big department meeting you know your team members will be there. Approval workflows keep you moving forward. We’ve seen it all. Multiple levels of approval needed? Various employee PTO policies? Custom time-off categories? No problem, no problem, and no problem. Whether your company’s approval process is super simple or incredibly complex, our systems can handle it. You can create approval workflows with up to five individuals to keep everyone in the loop. Once an employee submits a request, managers can approve it instantly. They can also send a custom response to the employee in case the request needs to be denied or adjusted—all with the push of a button.